Higher Dropout Age May Not Lead To More Diplomas In his State of the Union address, President Obama called on every state to require students to stay in school until they graduate or turn 18. But unimpressive results in states that already have that requirement raise questions about how effective the initiative would really be. 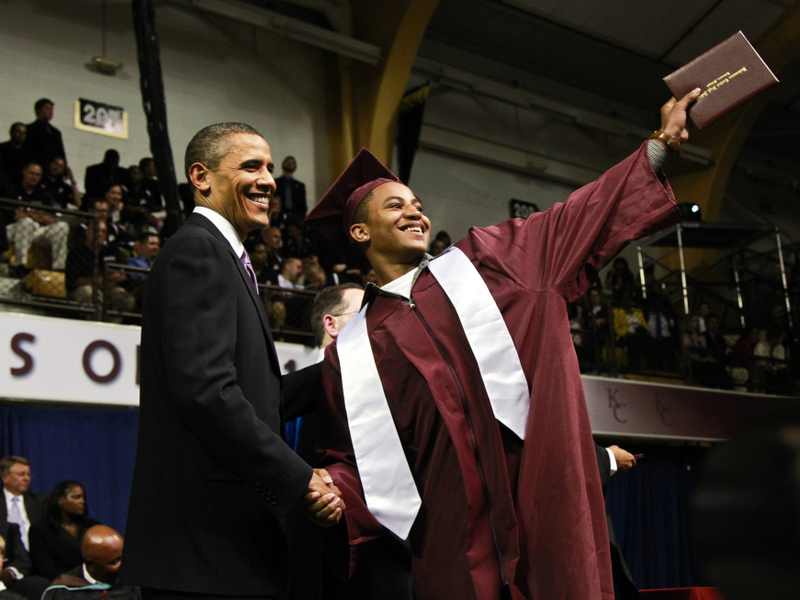 President Obama delivers the commencement address for Kalamazoo Central High School's class of 2007 in Kalamazoo, Mich. The state requires students to stay in school until they turn 18. In his State of the Union address, President Obama called on every state to require students to stay in school until they graduate or turn 18. "When students don't walk away from their education, more of them walk the stage to get their diploma," he said. For New Hampshire Deputy Commissioner of Education Paul Leather, the president made the right call in his address. "What it does is it sets the moral imperative so that students and parents and educators become committed to the idea that each student will in fact graduate," Leather says. New Hampshire recently became one of 21 states that require kids to stay in school until they turn 18. Leather says his state decided to raise the compulsory schooling age after looking at the research. "What we found both in national and international research is that when you raise the compulsory age of education, the graduation and retention rates will in fact increase," he says. But according to Russell Rumberger, an education professor at the University of California at Santa Barbara and author of the book Dropping Out, raising the schooling age doesn't necessarily mean dropout rates will go down. "You can't just look at the graduation rates or dropout rates by state and relate it to its compulsory schooling age and say, 'Aha, there's a direct connection,' " he says. According to Rumberger, all you have to do is look at the 21 states where the compulsory schooling age is already 18. In Nevada, the dropout rate is 58 percent; in Louisiana, it's 43 percent; in California, it's 37 percent. The other 18 states aren't much better. Then there are states like Kentucky, where kids can leave school as early as 16. That's been the law since 1934, and yet in recent years, Kentucky has dramatically lowered its dropout rate by focusing on the causes. Lisa Gross is with the Kentucky Department of Education. "The reason kids drop out in Kentucky, and I suspect that this is the case nationwide, is not because they're falling behind," Gross says. "It's because they don't see a connection between what they're learning in high school and what their lives are going to be like as adults." Gross says Kentucky has worked hard to provide students multiple pathways to graduation. It has created a support system and gotten parents involved. But holding on to some kids hasn't been cheap — or easy. "If you force children to stay in school when they don't want to be there," Gross says, "schools spend a lot of time addressing discipline problems and other issues that pop up." According to Gross, President Obama's remarks were still important, and Rumberger agrees — as long as people don't come away with the expectation that raising the compulsory age to 18 is going to solve the nation's dropout crisis. "I don't want to discount it," Rumberger says. "It's an important thing to do in the right direction, but by itself, it's probably not going to make a big improvement."